Get accurate device details such as e.g. : screen model, operating system, browser type, resolution or firmware version. 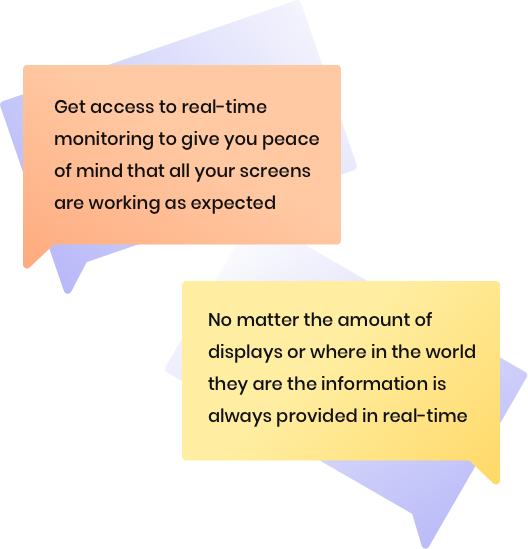 With the live screenshots you will be always 100% confident that your displays are online and are playing the right content. Easily monitor your displays by accessing real-time information such as temperature, disk, RAM or CPU usage. Get accurate information on your network and signal strength. Remotely adjust your screen’s brightness and volume. Easily change screen orientation from landscape to portrait and the content will automatically adjust to the display. Save energy by remotely controlling your screen’s sleep time. All the updates are carried out remotely with no downtime so you’re always running the latest version of the software. We are continuously adding new management and monitoring features and expanding the range of supported displays. The list of currently supported features is also available to download.